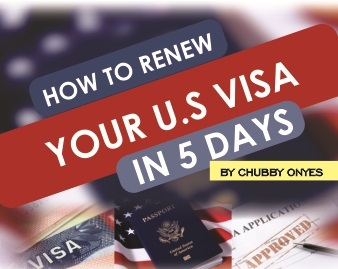 REVEALED: HOW TO RENEW YOUR U.S. VISA IN 5 DAYS WITHOUT THE HELP OF AN AGENT. When you​ use these 3 steps, you will soon get your U.S visa renewed in just 5 days. If you don’t, you will keep wasting time and effort to get your U.S Visa renewed. Inside this guide is a set of specific information (with pictures) that you can follow on a step by step basis to renew your U.S. visa within a very short time. These set of information are not known to most people which is why they look for agents who will help them in the process. So I have put together this guide/tutorial to help renewing applicants start and finish the U.S. renewal process from start to finish within the shortest time possible. Instead of paying N50 ,000 or more to those agents, you can sit down at home and renew your U.S Visa – by using this same guide that has worked for me and others. Are you scared of paying huge agency fees to agents especially when you don’t even trust that your Visa renewal will be approved? ​Would you like to learn how to renew your U.S. visa by yourself? I have written a 33 paged guide (with pictures) that gives a step by step explanation on how to renew your U.S. visa without the help of any agent. It does not matter if you are young or old, man or woman, you can use the information inside this guide to properly renew your U.S. visa. Documents Needed for USA Visa Renewal. How to Make Payment for your Visa Fees. How to Fill Out the U.S Visa Application Form Again (With illustrating Pictures). How to Apply for and Get Your Dropbox Confirmation Letter (With illustrating Pictures). Frequently Asked Question about Dropbox. You do not need any agent to help you if you follow this “U.S. visa renewal guide” to the end.